This is part 5 in a 5-part series examining quarterback Jimmy Garoppolo's 5 game stretch in 2017 that will examine some troubling trends in the quarterback's performance. Parts 1-4 are linked at the bottom of the article. In the first four articles of this series, we spent a great deal of time examining all the things Jimmy Garoppolo does well. His accuracy, decision making, third down efficiency, and poise under pressure and against the blitz are borderline elite for a quarterback who's started just seven games in four years. However, no examination of a quarterback would be complete without highlighting the areas he needs to improve. There are not many but they are enough to cause some concern going into the 2018 season. Quarterback evaluations are multi-level analyses with each evaluator at different websites prioritizing and contextualizing certain scenarios and traits over others. In deep passing in 2018, an area in which Garoppolo really has struggled since before being traded to the 49ers, Pro Football Focus graded him as tied for 31st in accuracy, sharing that honor with Tom Savage (31.3%). Pre-Snap Reads' Cian Fahey, in his 2018 Quarterback Catalog, graded Garoppolo also as tied for 31st in deep passing accuracy (21+ air yards or further) with Deshaun Watson (27.3%). Jonathan Kinsley, who runs the Deep Ball Project, graded Garoppolo as the 8th best in downfield accuracy at 57.1% but counts any passes from the 16-20 yard range in there, which significantly boosted the quarterback's accuracy due to the slightly shorter yardage throws. While that's a big discrepancy in how he was graded by various evaluators, one thing is certain: he does struggle throwing the ball deep. According to Fahey's analysis, he threw 10 interceptable passes in 5 games as a starter, with 5 coming against Houston (a number which I have disputed in the past). Nonetheless, it was a game in which he made a number of errant and risky throws. An interceptable pass is defined as a pass that is thrown and gives a defender an opportunity to catch the ball. For example, Brian Hoyer threw 30+ interceptable passes in 2014, passes that defenders actually got their hands on cleanly but dropped (they're not receivers after all). Think if just five more of those interceptable passes that Garoppolo threw were interceptions (or even three more): he'd have been a seven touchdown, 10 interception quarterback in five games and we'd be likely be doubting if he's really worth the contract he was given. (For what it's worth, I charted only two interceptions of the five as quarterback responsibility). If at this point you're thinking "so what this is just stats," congratulations, you now understand my pain when explaining that film also matters, not just stats. It is highly volatile relying solely on stats as a way to evaluate a quarterback so it will be necessary to go to the film to see how and why he struggles. Using interceptions to measure how good a quarterback is at taking care of the ball is too volatile. It relies on too many factors that the quarterback doesn't control. Instead looking at the opportunities the quarterback gives to defenders is a much more telling, more reliable and more consistent prism to view ball security through. While I don't fully agree with Fahey's numbers of interceptable passes for Garoppolo, I do agree that he threw the ball a fair number times with reckless abandon and gave defenders plenty of opportunity to make interceptions. So let's look at some of the interceptable passes and head scratching decisions. Against the Texans, Garoppolo threw a fair amount of reckless passes that the defense just didn't capitalize on. 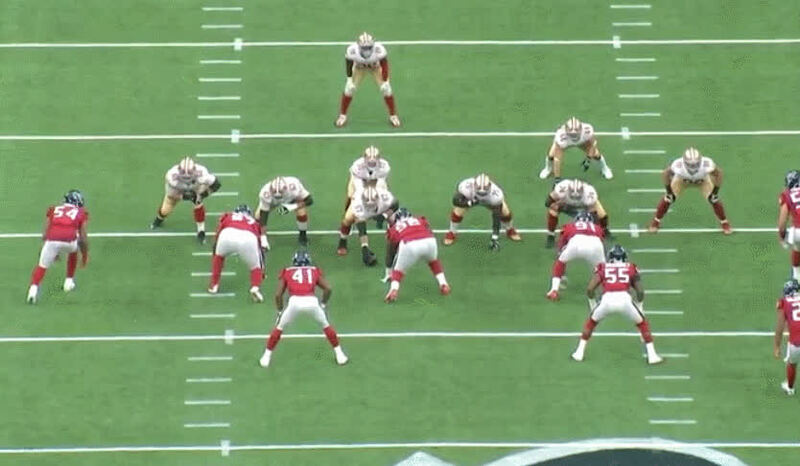 However, the Texans defense baited him into an errant throw early in the first quarter. Texans linebacker Brian Cushing lines up in the box and appears to be coming on a blitz, cluing Garoppolo in on a potential throw to receiver Trent Taylor on a short curl route to beat the blitz. However, Cushing drops into a hook zone underneath Taylor's route while defensive end Jadeveon Clowney beats right tackle Zane Beadles around the edge, forcing Garoppolo into a rushed throw and interception. Had he seen Cushing drop, he immediately could've come back across the field to tight end Garrett Celek (though Celek did slip but the quarterback could not have known that would happen). Early in the second quarter on 1st and 10 also against the Texans at the 49ers 37 yard line, the 49ers lined up in Shanahan's favorite personnel grouping, 21 personnel, with two backs, one tight end, and two receivers. Garoppolo makes another head-scratching throw over the head of Celek and the only reason the defender doesn't intercept it is because he fell. 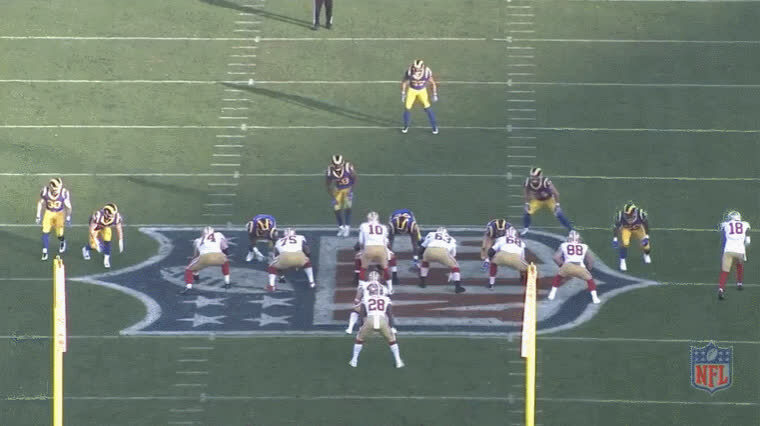 On the play, Beadles gets beat around the edge and instead of stepping up into the pocket, Garoppolo shifts to his left into the rush of defensive tackle Carlos Watkins, just as receiver Marquise Goodwin comes open on a comeback route. If he had had shifted up into the pocket, he likely could have hit Goodwin for a nice gain. Given his poise to stand in the pocket and deliver passes as he's hit, something he was very good at, it's puzzling why he wouldn't try to shift up here. 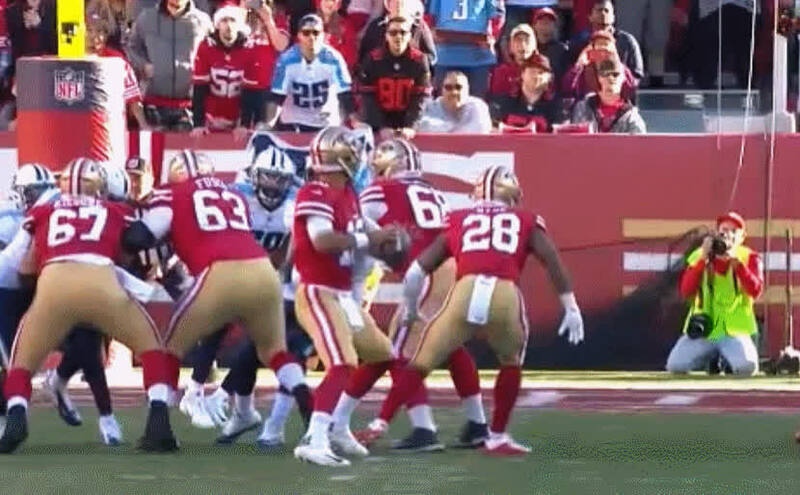 Lastly, on a 1st and 18 with 4:47 left in the game against the Titans, Garoppolo threw what eventually could've been a game-sealing interception for the Titans. Fortunately the pass fell incomplete thanks to the instincts of Goodwin to break up the pass. In 11 personnel (one running back, one tight end, three receivers), Garoppolo motions running back Carlos Hyde out to the left as the outermost receiver, creating an empty five-wide look and confirming man-to-man coverage. 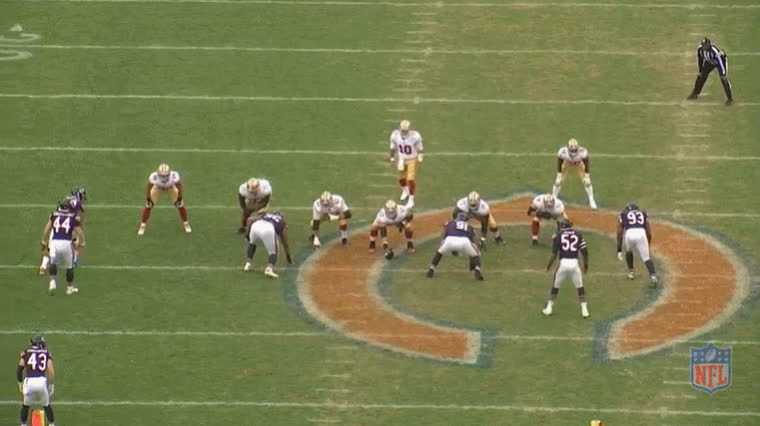 The 49ers run the smash concept to the right side with Trent Taylor as the outermost wide receiver and Goodwin from the slot. From a clean pocket, Garoppolo then throws a deep pass out to Goodwin who is covered by defensive back Adoree Jackson. 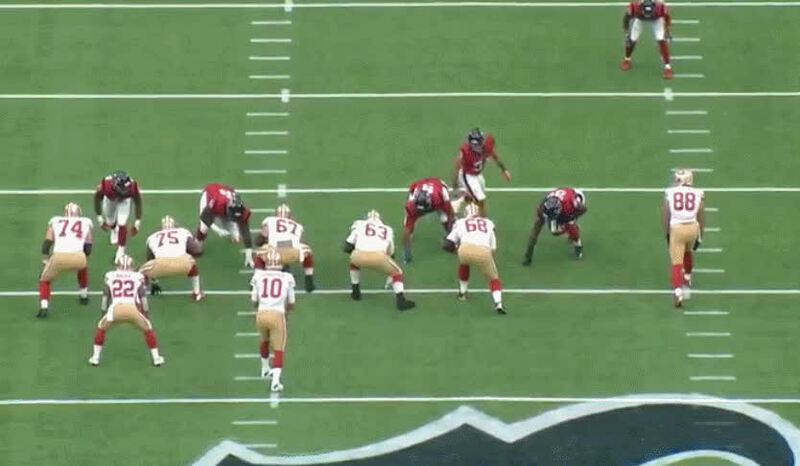 Garoppolo has room to put the pass out in front of Goodwin and certainly has the arm strength to do it but instead of stepping into the throw, he plants toward the sideline, getting no hip rotations, and shifting the weight off his plant foot as he throws and the pass floats on him and Jackson is able to get up and high point the ball as it's behind Goodwin. Goodwin makes a smart play to break up the would-be interception and the pass falls incomplete. 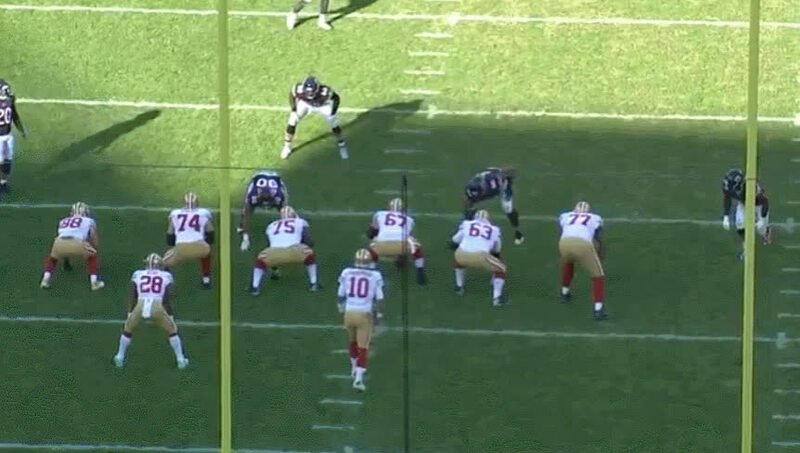 First, if you haven't watched Brett Kollmann's video breakdown of Garoppolo's footwork, I suggest doing so. What follows is a synopsis of that video with examples and further breakdowns, but this section owes a debt of gratitude to Brett. So what was the problem on these passes, and largely all the wild and errant passes Garoppolo threw? It all starts with the feet. First, it's not all doom and gloom with this particular skill set of Garoppolo's. He's shown more than once that he can remain inside the pocket in the face of pressure and deliver accurate pass after accurate pass to move his team down the field, as I have shown in this series' previous articles. He doesn't have perfect mechanics on some of these throws and on others he prioritizes mechanics over the physical abuse he takes from pass rushing defenders, but evaluating quarterbacks solely on their mechanics when other traits are enough to overcome flaws here and there can cause an evaluator to miss the special traits that make a quarterback great. His quick release, mental processing speed, and short-to-intermediate range accuracy, especially under pressure, are among some of the best in the league. But on several occasions, Garoppolo has had to overcome bad mechanics with those other skills to keep drives alive and the team in scoring position. Early on in his starts for the 49ers it was apparent that he lacked the ability to throw deep passes with any consistency because his footwork prevented him from delivering passes with enough control and velocity. And in several situations, like the example a few paragraphs above in the underthrown pass to Marquise Goodwin, and others, any consequent interceptions likely would've thrown his future with the 49ers in doubt heading into the offseason. Let's look at a play from the above montage of less than stellar throws. One play in particular highlights the fundamental flaw that he'll need to address this offseason, one that the truly elite quarterbacks spend their entire careers perfecting, and that is his delivery platform/footwork. The glaring issue with his footwork is that he has a tendency to not open up his front foot (plant foot) to the target. When a quarterback doesn't open his front foot the target, it screws up his weight transfer on the rest of the throw. The back foot lags behind, the hips don't rotate and generate torque, and the throwing power is generated in the elbow and shoulder, causing control issues. A quarterback's throwing power, like most athletes, is generated in the hips. Try and throw a football with just your arm and then try and throw it while rotating your hips. The ball travels much farther and with greater control. Even baseball players, try swinging a bat with just your arms and then try swinging while rotating your hips. You generate much more power. On this throw, if Garoppolo had pivoted on his front foot and shifted his weight forward, his hips would rotate, and he would've tossed a much more accurate and controlled pass to Bourne, that would've likely went for a touchdown. Instead, no pivot and no weight transfer puts all the stress on his elbow and shoulder to generate the power to control the velocity of the pass. For the most part though, he gets away with it on shorter range throws because the pass doesn't have to travel as far and with less velocity. He's still pretty accurate. On deeper throws however, it is the sole reason why he did not connect on so many deep passes that were wide open. Garoppolo struggled with the deep ball while he was in New England and not much of that changed with the 49ers. 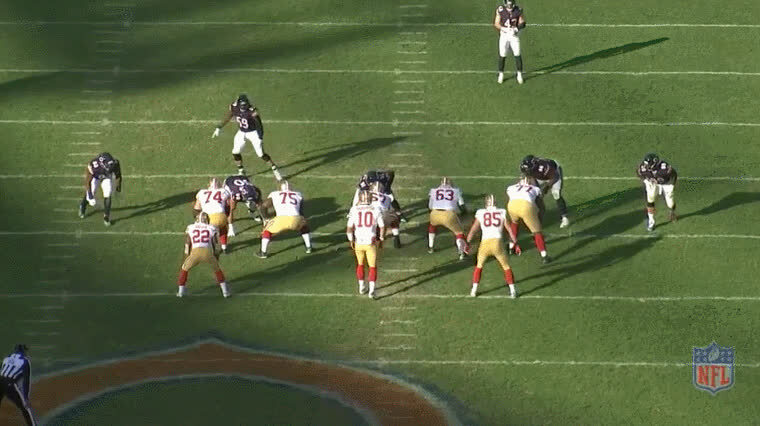 In his first start with the 49ers against the Bears in Week 13, the shaky footwork stood out immediately. 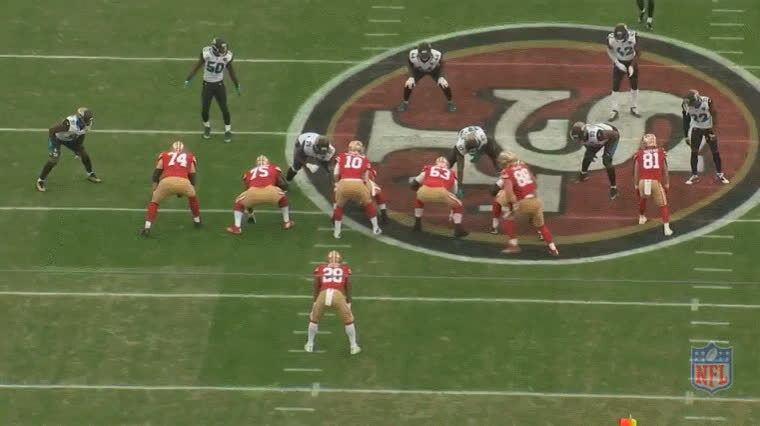 On a deep corner route to Celek, Garoppolo drops back and plants his front foot downfield away from the corner route. The movement causes him to torque his upper body and arm enough to get throw off because he could not bring his hips and back leg through, and the pass sails over Celek's head and out of bounds. If we dissect the throw at this frame, we can see why the pass is off target. The front foot needs to be open to the target, which will naturally place the trajectory of the pass inside that lane. When the trajectory is outside the direction of the plant foot, it's considered closed off to the target and the pass is much harder to control. Same issues on this throw: the plant foot is pointed downfield and Garoppolo subsequently loses velocity on a deep route to Louis Murphy. When the plant foot is pointed at the target, the pass is much easier to complete, is accurate, and is on target. Let's look at this example from Green Bay Packers quarterback Aaron Rodgers. This play from Aaron Rodgers demonstrates what it's supposed to look like when the arm follows the hips and the hips follow the feet. 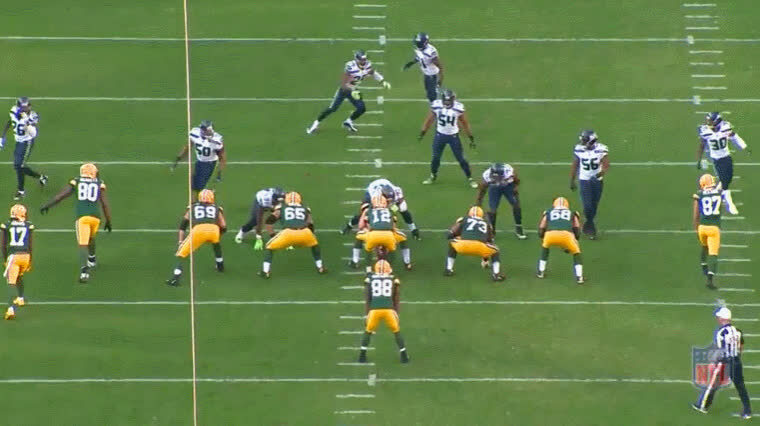 Rodgers' front foot plants and pivots open to the target. As he rotates his hips, his arm naturally follows through to the target and finds Jordy Nelson in the end zone for a touchdown. Even in my seventh year, I'm still trying to break old habits I learned as a kid. You're taught to get back as deep as you can as quick as you can, but you can never throw the ball out on time when you do that. Learning to time up my drop with each route has been a big thing for me. It allows me to throw the ball in rhythm and hit the same release point with every throw, meaning that no matter what else is happening, the ball comes out on a similar plane. That's when accuracy comes. Those nuances have allowed him to master every conceivable route concept and the timing required to throw on time and in rhythm, something that he works on year after year. For Garoppolo to take the next step, it something he must dedicate his craft to. 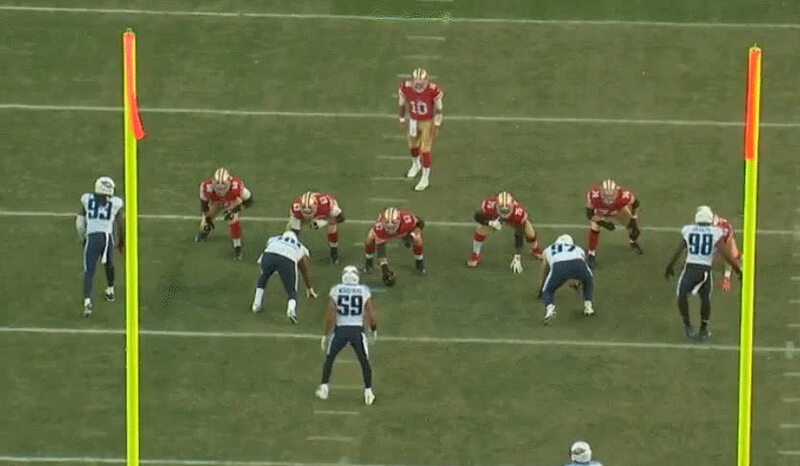 One last flaw that jumps out on Garoppolo's deep passes is that when he does point his plant foot towards his deep target, he sort of hops on the front foot, causing an unbalanced weight distribution, culminating in the series of effects I described earlier about it leading to lack of hip rotation and torque, which leads to a reliance on generating power in the elbow and shoulder. On this throw, after Garoppolo drops back, instead of pivoting and opening up his hips and rotating into the throw, he sort of hops on the front foot as he throws, causing him to shift his weight away from the throw and putting all the strain on his elbow and shoulder. Kendrick Bourne was wide open too. He had time to settle his feet and deliver an accurate strike downfield, and instead he frantically hopped about and sailed the pass over Bourne's head and out of bounds. I have no doubt the 49ers offense will be even more efficient next season in a full 16 game slate, and Garoppolo might even be a top five quarterback in major statistical categories. But he also might be top five in total interceptions. For Garoppolo to truly elevate his game, he will need to constantly and consistently show improved footwork. If he can make even simple adjustments this offseason, the deep passing game will be an added element that teams will have a hard time defending with the speed at the receiver position. Garoppolo has more than a strong enough arm to hit those passes. If he can marry up the feet to match the velocity and control needed to hit these passes, then he will more than elevate the offense next season and they could make a significant push toward a division title and a playoff berth. Comment: I tend to agree with most of what you print, but like anything to do with politic's now a days, Please don't get testy simply because some one disagree's. Yes I know a lot of those posting here do, but they are not the Professional's. You'll keep more readers if you take the advise. I hardly ever read Grant anymore because he hasn't figured that out and the fact he plays devil's advocate 90% of the time and denies it when called out on it. Speaking of politic's, does that sound familiar? Response: thanks! yes, some of it was inspired by brett's work, in terms of finding specific plays and understanding certain traits, but I also wanted to cover other aspects of his passing like the reckless throws in the first part, and wanted to show other plays where he had perfect mechanics. Whether or not I explained it all good enough is a different matter but I appreciate your feedback. Comment: I didn't say it was a stat based article. I'm pointing out that any small-sample size analysis (12 passes) will be fundamentally flawed due to an insignificant sample size. I'm pointing out that all deep routes are more than 'just the QB' so QB based analysis is fundamentally flawed because 'accuracy' is a product of WR as much as QB. And, last, I'm pointing out that every QB in the NFL, due to the fact deep ball passing opportunities are few and there are so many variables in them, that in any one year any QB can vary wildly in his performance. So you missed the point. What you did was take a very limited sample on a talent poor team with a QB who did not have the time to develop rapport with his WRs and decide he needs to improve his game. I'd say you need to improve YOUR game if you're going to put out 'analysis' and grasp how you failed to account for any of this as you wrote a rambling article signifying nothing. Response: Again, you have yet to show me where you got the number 12. He threw more than that. You didn't say it was a stat-based article yet your entire criticism is...stat-based as you're claiming "sample size" will fluctuate. Sure. It absolutely will. That's not the concern of my article. My concern, as I wrote extensively, is with his **mechanical flaws** throwing the deep passes. You know, footwork, hip rotation, etc., not that he isn't completing them, though that is 90% of the reason why. You still can't seem understand this, that his throwing mechanics have no bearing on whether or not the talent around him is any good. Read it again, watch the clips, try to understand the mechanics of throwing. When the vast majority of Garoppolo's deep passes are over and under-throws, that's 99% on the QB, saving the 1% on the WR because he might have ran the wrong depth or route but you can never know. An overthrow is still an overthrow. Talent would be an issue if they weren't getting open (they were) or dropping passes (they weren't). Guys were wide open. If you had read any of the articles I wrote before this on him, you wouldn't be saying anything you're saying here. Like I said, keep being mad, or do yourself a favor and go read them. You've also given no examples of where my writing is flawed. There are plenty of examples above. So again, what is your problem here? Comment: There's are three fundamental flaws in this analysis which, to me, make it a pointless exercise: First, Garoppolo only threw 12 passes 20 yards. This is too small a sample to have any value whatsoever. Second, WRs are part of 'accuracy.' It's not just the QB in deep passes, it's the WRs making adjustments to the ball. And the further the pass, the more dependent on good WR adjustments the throw has to be. Third, deep-ball passing is a very-erratic stat. Rogers, one of the best deep-ball passers in the NFL: 2017 - 9/23 - 39% 2016 - 21/72 - 29% 2015 - 15/54 - 28% 2014 - 24/48 - 50% 2013 - 17/37 - 47% 2012 - 21/53 - 39% However, I can assure you that if you dig deeper into his game-log performances and take any twelve passes, you're going to find yourself with huge swings even greater than the 29% to 50% completion rate swing we've seen between seasons. Truthfully, due to the small sample sizes involved, it will take at least a couple of years for anyone to know if Garoppolo is a good deep ball passer. And even if he is, he's going to suffer wild swings in his completion rate. Response: To address your points, this is not a stat-based article. So your criticism is flawed from the start. Point 1) He didn't throw 12 20+ yards. I don't have any clue where you get your numbers from but I cited where I got mine: from 3 different sources. Not a single stats website defines a deep pass as 20 yards. I'm talking about 21+ AIR YARDS, which is what it's classified as. You can read the article to see where I got those stats and go to those resources. Point 2) The majority of passes I showed here show the receivers WIDE OPEN on their routes with passes sailing over their heads or falling short. You have no more idea than I do what they are supposed to do beyond getting open and don't know if they ran the wrong depth or not. Also, WRs that have to make adjustments on passes...those aren't accurate passes if the WR has to make an adjustment on it. Point 3) Again, where are these numbers from? You're likely giving me completion percentage anyways because Rodgers had a deep accuracy of 57%. A pass can be accurate but not complete and vice versa. I don't care about completion percentage. I care about accuracy, and I showed why Garoppolo wasn't an accurate deep passing QB. "However, I can assure you that if you dig deeper into his game-log performances and take any twelve passes, you're going to find yourself with huge swings even greater than the 29% to 50% completion rate swing we've seen between seasons." I don't care about completion percentage. He's never been an accurate deep passer. I written on this before. Feel free to dig into my articles here and read them. "Truthfully, due to the small sample sizes involved, it will take at least a couple of years for anyone to know if Garoppolo is a good deep ball passer. And even if he is, he's going to suffer wild swings in his completion rate." If you read any single article from this 5 part series, you'd know that I showed how good he was in 5 games IN 2017. I cited stats that showed how and why is overall accuracy was good, how good he was against the blitz and under pressure, and how good he was on 3rd down. Based on numbers from 2017. 2017. 2017. His deep passing accuracy was abysmal. I showed why. You might want to read it again and see what mechanical flaws he CURRENTLY has. I made no predictions about whether or not he would improve or not. Or continue being salty. Or feel free to watch film and write your own film-based analysis. Comment: When Garoppolo became a full time starter, I'm sure that Shanahan spent countless hours in the film room and on the field working on mechanics with Jimmy G. Kyle Shanahan was the quarterbacks coach with Houston and an offensive coordinator for several years, so Garoppolo is in a great situation. Back up QB's get very little practice time with the offense. Brady is another one of those guys that dominates the time in practice. Back when Favre played in GB, he routinely took ALL of the reps in practice. A lot of people forget that Steve Young went 5-5 in his first full year as the 49ers starting QB in 1991. His deep throws need work, but I expect to see great improvement in 2018. Comment: Ugh thank you for bringing this to my attention, this changes everything. We'll get to work on this right away! ???????? Comment: Excellent work. It was fun to watch you dissect last year and give us something to look forward to this coming season. Comment: I'm not saying it's not a well written article, and he obviously did his research. If someone doesn't know what they're talking about and just posting garbage I wouldn't even bother commenting. However I'm still sticking to my point that altering mechanics for a QB is not always for the better, Jimmy is great because of his quick release and accuracy why would you want to change that? and I believe the deep ball will come with time. Comment: Lol. Get em Rich. It's actually refreshing to see someone stick up for their work and research. Comment: I did, I said Jimmy didn't have the pieces around him to be an effective downfield passer. Poor o-line and teams being able to easily defend against his only deep threat. Response: Again, look at the throws. The deep receiver in almost all of them is wide open. And he's throwing from clean pockets. Accuracy downfield is not so much affected by subpar receivers as it is the QB putting the ball in spot where the defender isn't. Accuracy is also not completion percentage. You can can have a higher accuracy rate and lower completion rate and vice versa. But over and under-thrown passes are the result of poor mechanics, not WR talent. Comment: Daniners-- Why are you hating? It's clearly a well researched article. Just cause somebody didn't do something in the past doesn't mean they won't do it in the future. I started having a sinking feeling in my stomach because I remember alot of those throws and thinking he was lucky on quite a few. Changes the whole outcome of games... It seemed to me he was money on 3rd down though-- a rarity among 49er QBs in seemingly forever--and keeping the drives going was how he churned out the stats and eventual contract. He is understandably over hyped, and I've been wanting that train to slow down. Hopefully he continues to improve. The 49ers organization, top to bottom-- is dependant on his progress so hopefully someone has already documented all this with him. This is good work though, good insight. It takes a lot of time and film study and I know it's frustrating when ppl just dismiss that. I know Drew Brees is a QB that seemed to take a big jump in a stable system and is often lauded for his throwing platform and footwork. His lack of height probably contributed to his urgency in mastering that aspect of QB play. Hopefully Jimmy G will take that kind of jump. Comment: If you're writing an article like this you should be able to handle objective criticism. I don't necessarily agree that Jimmy has huge flaws in his deep passing game, am I supposed to say nice article and move along? Man people are so damn sensitive these days! Response: there is no such thing as "objective criticism" here. just people saying "nah uh you're wrong." i am not opposed to criticism and civil discussion at all but you've got to actually pick something in the article you disagree with and support your opinion with evidence of some kind. Comment: To answer your question, I have no idea if you stated anything incorrectly. I have my own opinions about JimmyG, but I'm not qualified to write an technical article. If you are going to technically evaluate anything in life, you should have a degree of expertise on the matter. You are breaking down his mechanics, his footwork, so I asked, what do know about evaluating QB's? Were you a coach? Have you instructed QB's at the high school, college, or pro-level? Otherwise, it's an article by a fan with no background in evaluating QB's. Response: I've coached over the years and played the position. My problem with your comment isn't that though. You obviously don't agree with it but I bet you'd agree with the 6 other articles I've written here and elsewhere praising him for the things he does really well. Some of them are linked above. Comment: My goodness, stop being such fans and be objective. You don't have to be a quarterback guru to see that Jimmy missed some throws he would like to have back. He is not a finished product. He needs to get better in certain areas. It's a good thing that Jimmy can still get better. We all want him to be great don't we? Just like any great player, he has to continue to work on his craft. Comment: You try throwing with a lineman like Zane Beadles tripping over his own mullet, it's not easy. Response: these are all from clean pockets. in fact, you should read the other articles listed above about him throwing under pressure and against the blitz. thanks. Comment: I have to agree with DaNiners comment, Jimmy G is great because of his quick decision making, accuracy and lightning quick release. We haven't had a large sample size of his deep ball yet, mainly because his lack of deep threat receivers. Goodwin is a great deep option, however with a poor offensive line, defenses were able to put a high Safety over Goodwin's Side of the field and not worry about anyone else getting open deep. Also Phillip Rivers has below average footwork and still makes some great downfield passes. Response: Daniners didn't say any of that. You're actually agreeing with me about his quick release, decision making, and accuracy because I actually wrote those things too. There is nothing true about anything else you said. All these throws were from clean pockets or mistakes that the quarterback is responsible for. Having "options" isn't an excuse for poor mechanics. Comment: Excellent article.. Jimmy gets away with poor foot mechanics because with no pass protection his throws were primarily short to medium quick release types where arm adjustment to the target was all he really needed. Hopefully with more time he will recognize the need for better footwork which will not only improve his deeper throws but also his shorter throws. Response: no it didn't. the receivers don't make him throw with poor footwork/mechanics. from clean pockets. Comment: Very interesting breakdown. Do you envision Jimmy G correcting the footwork flaw on deep passes under Shanahan, or is this just who Jimmy is given he's had 3 seasons to correct it in New England and hasn't (yet)? Response: yes, but i don't expect him to fix him to solve the problem in one season. it's concerning that he spent 4 years in NE and this is where he is with it but hopefully someone is in his ear about. the guy he trains with in the offseason is really good so i have to assume he is working on it. Comment: I'm sorry, you're expert on QB play how exactly? What's your background? Have you worked, or evaluated pro QB play in the past? Response: Is there something wrong with the article? Did I incorrectly state something?